AVIST courses are developed using VClass platform. Vclass is an open source e-learning platform developed by the Distributed Education Center at the Asian Institute of Technology. It is specifically designed for delivering online course by two different methods – through “virtual classroom learning” or “virtual class on demand”. ASEAN countries urgently need to improve the knowledge and skill of their workforce, especially in the fields of science and technology. Through Virtual, the workforce can update their professional knowledge and skill without having to interrupt their working routine. Collaborative efforts among ASEAN countries will insure that the subject matters of the courses offered are relevant to the needs of the region. Accredited courses on selected subjects in science and technology will also enhance graduate education in participating institutes. When did AVIST start operation? The concept of AVIST was discussed at, and endorsed by, ASEAN Summit, 1999, following development by ASEAN Committee on Science and Technology (COST), as part of the strategy for continuing professional education. A series of planning meeting were organized by UNESCO (Manila 1999) Bangkok 1999, Bali 2000, Lankawi 2001). This pilot site was set up by Thailand Graduate Institute of Science and Technology (TGIST ) and Asian Institute of Technology (AIT ) in January 2002. This will be joined into a set of mirror sites by participants of the UNESCO meetings and other ASEAN organizations. As a virtual Institute, AVIST does not need a physical campus. However,the campuses of various participating universities and institutes will serve as the physical site. In the starting phase, AVIST is run by a sub-committee under the ASEAN committee on Science and Technology. How is AVIST operated ? A joint panel of experts in science and technology works out the rules and regulations of AVIST. In the initial stage, each pilot site offers some courses which are appropriate for sharing among ASEAN countries. Joint accreditation and joint curricula are being developed. 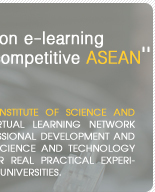 Copyright ©2004 ASEAN Virtual Institute of Science and Technology, AVIST All rights reserved.